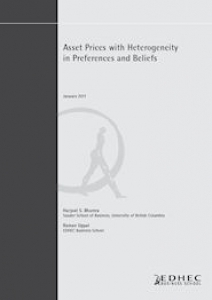 In this paper, we study asset prices in a dynamic, continuous-time, general- quilibrium endowment economy where agents have power utility and differ with respect to both beliefs and their preference parameters for time discount and risk aversion. We solve in closed form for the following quantities: optimal consumption and portfolio policies of individual agents; the riskless interest rate and market price of risk; the stock price, equity risk premium, and volatility of stock returns; and, the term structure of interest rates. Our solution allows us to identify the strengths and limitations of the model with heterogeneity in both preferences and beliefs. We find that beliefs about the mean growth rate of the aggregate endowment that are pessimistic on average (across investors) lead to a significant increase in the market price of risk, while heterogeneity in risk aversion increases stock-return volatility. Consequently, the equity risk premium, which is the product of the market price of risk and stock return volatility, is considerably higher in the model where average beliefs are pessimistic and risk aversions are heterogeneous, and this is not accompanied by an increase in either the level or the volatility of the short-term riskless rate. The main limitation of the model is that it is stationary only for a restricted set of parameter values, and for these parameter values one can get a high market price of risk and equity risk premium but not excess stock return volatility.